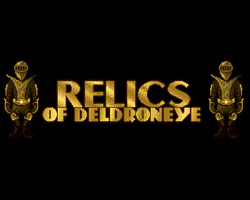 Lee Bamber the creator of Relics of Deldroneye has kindly agreed to answer some questions about how he got into programming and the inspiration behind his games. Enjoy! I started programming at the age of 9 with a VIC-20, and being a member of the commodore faithful upgraded to the C64 and started writing games and programs for my own amusement, and also for magazines. My uncle bought an Amiga (expensive at the time) and I would visit quite a lot to 'have a go' and also to discuss programming as we were both coders. After a few years of persistent nagging, my parents bought me my own Amiga as a Christmas present. It was the only present I got that year, and it changed my life. I naturally carried on my game programming on this new machine, but had to work my way through the horrid world of AmigaBASIC, Assembly and C before finally discovering AMOS, a very cool language and perfect for writing games. How did Mike Richmond become involved with the music on your games? Not entirely sure as it was over twenty years ago. I think Mike had a collection of music tracks in one or two PD/shareware/license ware libraries at the time and it was common for programmers with no music skills to ask permission from the musicians if we could use their work in our games. Mike was happy to agree, and also to produce custom tracks as well, and it went from there. How did you get inspiration for the stories of the Relics of Deldroneye games? I was a big fan of Monkey Island, and played that game to pieces. I also had the same sense of humour and it really inspired me to write my own point and click adventure that had a few jokes and comedy moments. The story itself, like all good ideas, just popped in there one day. I liked the character so much, I think I did three games staring the fellow. 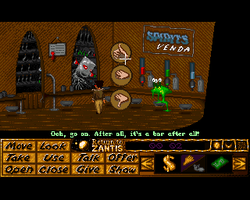 What was the main attraction of point and click games? For myself, it allowed you to escape into an interactive alternative universe and become part of the narrative. Back in the day it was text adventures, where your imagination painted the pictures, and then only crudely painted graphical adventures that bore little relation to the textual description and finally point and click where you could see the real scene and explore the world in great detail. What programming packages did you use to create the games? I used a few languages on the Amiga. 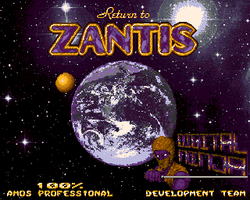 The first was AmigaBASIC but it took a very long time to overcome the basics like loading graphics and preparing sounds. I also wrote one or two games in 68000 assembly, but it would take weeks to string a few screens together. A number of C languages where experimented with, but they required heavy investment in money, time and a background in the language also helped. 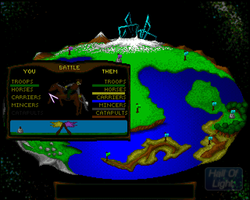 The language I finally rested on for most of the games I wrote was AMOS (Amiga Operating System), and later AMOS Pro. This language offered simple commands such as LOAD BITMAP, which in AmigaBASIC would have been three pages of rather complex code. What was the best thing about creating games? The best thing about writing games is the process of watching your ideas turn into something real. It is quite a buzz to have produced something with your own hands, and thought up with your own brain. Later on, I figured out that other people would pay me to play my games, but that happened much later. The original drive, and one that I still possess, is the creative process and making cool things. Which of your Amiga games were you most proud of? 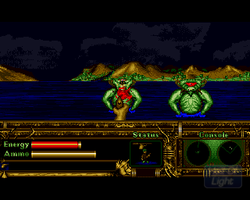 My proudest Amiga game was the Relics Of Deldroneye as it was a huge game for me (4 discs I think). It was featured in a magazine and normally they use a small box out to hold the screen shot and a brief description. This time they used the whole page in full colour with lots of graphics from the game peppered about, it took pride of place in my scrap book. Are there any unfinished Amiga game projects from that time? 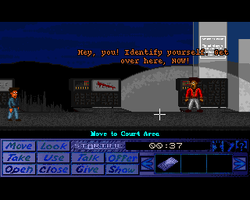 Only one that I recall, which was a point and click adventure creator. Relics was created almost entirely in code, but I wanted to create an editor which would make subsequent adventures easier to write (and could even be sold in it's own right). The project took well over a year and was well on it's way to completion and the next thing I knew I am a university student with 'assignments'. As easy as those assignments where, there was not enough time between travelling to university, doing coursework, preparing assignments to write a large adventure creator. What were the main advantages of programming on the Amiga1200 compared to the Amiga 500? Only the obvious ones, more speed, more memory, more hard drive space. Also by the time I had an Amiga 1200, I could afford to buy peripherals for it, and I recall buying the extra memory and the massive 120MB hard drive for it too. The Amiga 500 served us well, but the Amiga 1200 really pushed the boat out. At the time I was still using AMOS and eagerly awaiting the AGP commands to take advantage of those larger sprites, but they never appeared. The 1200 was a great machine, and like the 500, way ahead of the technology curve! 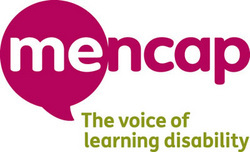 We hope you enjoyed reading the Lee Bamber interview - remember AmigaPd is charityware - please visit our just giving page to support our chosen charity Mencap.